Native to southern Africa, three species of plants are called "asparagus ferns." Not true ferns, they are members of the lily family, Liliaceae. Grow them as houseplants or outdoors in places where there are no winter frosts and the soil is moist, well-draining and in partial-sun to partial-shade locations, where shade is provided from the strongest sun of the day. Perhaps the most widely known "asparagus fern," this species has arching stems with small branches lined in bright green, needle-like leaves. The stems have occasional prickly spines on them. It grows vigorously, forming rounded water-storing bulbs underground. In summer this plant produces tiny white flowers that become pea-sized red berries that are eaten by birds. In subtropical locations like Florida, this species is invasive and regarded a noxious weed. There are two popular cultivated varieties, or cultivars, of this species. Also called the emerald fern, 'Sprengeri' has arching stems and a loose form, and readily sets fruits that will germinate in the garden. 'Myersii' is called the foxtail fern and has upright stems and rarely flowers or produces fruits, making it less pesky in an outdoor garden setting. Usually called the climbing or ground asparagus fern, this species has wiry stems that climb or sprawl with fern-like light green leaves arranged in whorls of two or three on the stems. It forms tiny white flowers in summer followed by red berries. This plant has a botanical name Asparagus plumosus. 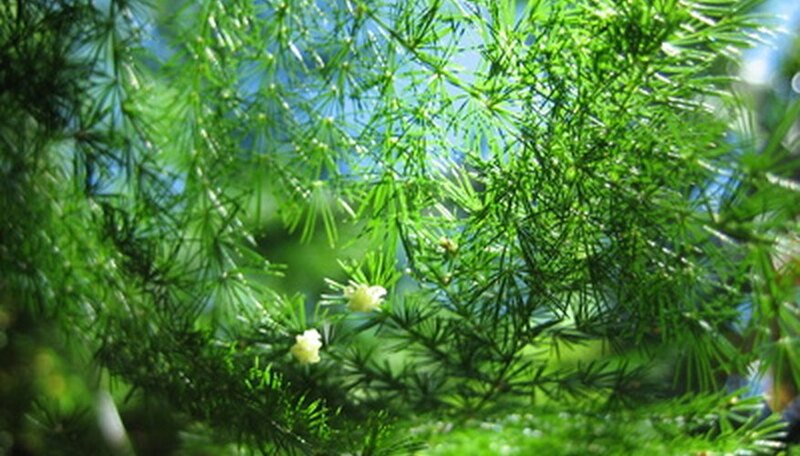 It is a bushy plant with frilly, feathery foliage emanating from a cluster of up to 20 stems. As the plant ages, some stems grow longer and twine, with curled spines on the stem to clasp to structures for support. It has tiny white flowers in summer followed by pea-sized purplish-black berries.